Maximizing Progress: Gearlegs ~ Jumping Juvenile Issus Coleoptratus! "...a champion jumper found in gardens throughout Europe. 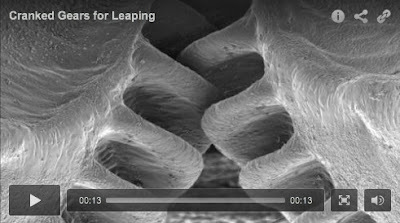 Its coglike joints were first described in the 1950s, but it was only with advanced high-speed video that the scientists were able to prove how the joints worked. Before the insect leaps forward, it hooks its gear teeth on one leg to the gear teeth on the other. That way, Dr. Burrows said, “the power is delivered to both legs at the same time, so no leg is twisted.” The legs are synchronized within 30 millionths of a second."